Some films age like a fine wine, becoming better with age even after multiple viewings. In the case of, Last Hurrah for Chivalry (LHFC), filmed back in 1978, our beverage is more like a beer that has gone stale long ago. The film cannot even hold a candle to some of the martial art films released in recent years. Keep in mind, LHFC wasn't directed by some hack. No, it was non-other than John Woo. The man that brought style to the cinema and redefined the action movie genre. 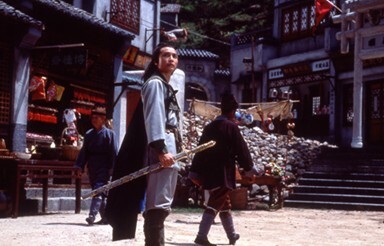 On his wedding day noble man Kao's is confronted by Pai and his henchmen. Pai kills Kao’s family claiming that Kao's father stole his land. Koa vows revenge, but since he is more of a scholar than a swordsman, he sets out to find someone who can defeat Pai and his cronies. He meets two alikely characters: Chang the swordsman who retired to take care of his sick mother and Green a wine drinking assassin. Together the two crash Pai’s fortress unbeknownst to them that Kao’s plan holds more than just revenge. The plot is typical of many marital films; first betrayal then revenge, repeat. The sword fights aren't as exciting as anything you might see today, but they are good enough. The characters are not fully developed so there is no one to care about and there is so much fighting that the movie begins to bore. I find it hard to believe John Woo directed this movie, since I don't even see a glimpse of his signature style except for some sloppy slow motion. The only thing I did enjoy about this movie are the performance by Kong Lau (Koa) and Lee Hoi-San (Pai). So you’ll probably only want to pick up this movie if you have to see every John Woo movie ever made or are a martial art movie aficionado.